As we bid 2013 good-bye some of us revisiting resolutions made at the beginning of this year, some are looking for the little slip on which they wrote them down yet others are smirking wondering what this resolution fuss is all about. 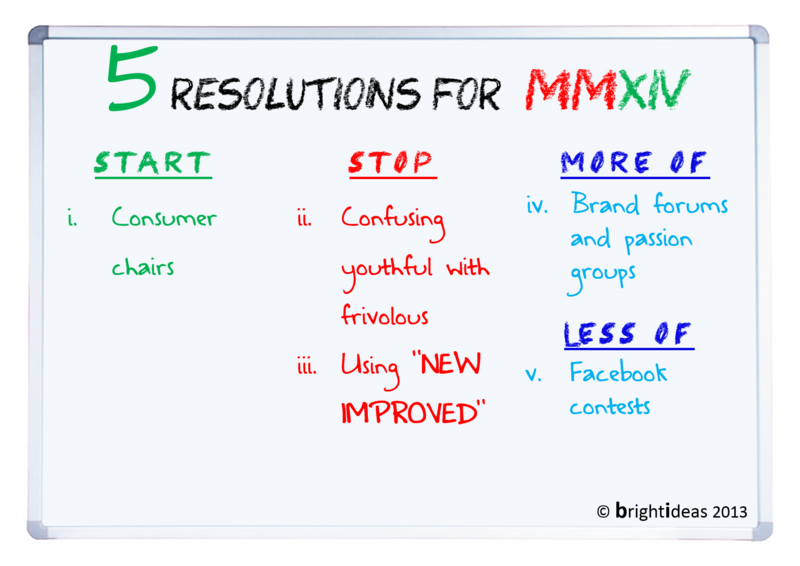 Effective execution or not, resolution making is a seasonal conversation topic that rears its head every new year eve. So here’s a brand take to resolution making. Stuff that yours truly as a marketer and consumer would like to see brands do or in some cases, not do. Every brand worth its salt keeps talking about how much time is spent with and understanding consumers. We conduct home visits, focus groups etc but for most organisations owing to whatever constraints this is sporadic. Brands in 2014 should commit to institutionalizing “Consumer Chairs”. Dedicate a day every month where your consumers are chairing your meetings. Whether its one or ten is up to you but its about time brands co-opted consumers into their core teams. Processes tend to benefit immensely if consumer perspective is blended in and who better to get it from. Don’t know why but most brands that want to target their communication to the youth insist on coming across with “attitude”. Invariably, this gets translated into either or all of these; Irreverance, High on innuendo, Slap-stick/wise-crack plots. Brands need to be cautious of the long term. While such communication can be entertaining it is seldom enduring. One common thing amongst great brands has been longevity. The oldest trick in the book,done to death. Every time there is a price move to be made, a pack size change or sluggish sales this seems to be the most accepted move. Get a new pack-if possible or put a sticker, a new TV spot or a tag, push R&D for a new colour and a whacky acronym and say abracadabra! Brand managers for generations have resorted to this. Would like to see an end to it especially the “micro-shine crystal” variety. With evolved and connected consumers of today brands need what I call brand vectors. Forums & passion groups as brands like Harley Davidson have realised are an extremely potent brand tool. Members are in it for the passion and commit to your brand by extension and spread your message becoming brand vectors much like the anopheles mosquito! Hugely recommend brands that can identify strongly with consumer passions to come forward. Time for brand epidemics! For God’s sake please stop asking us to post pictures of ourselves doing things and “tagging” you. I am sure all of us could do with less intrusion! So here’s wishing all a fabulous New Year!